Journey through the beautiful Arizona landscapes on this small-group trip from the Phoenix-Scottsdale area! Visit the Grand Canyon and explore Route 66 on an exciting full-day tour. After departing the Phoenix metro area, your tour travels through the expansive Sonoran Desert filled with the native saguaro cactus. The scenery begins to change as we increase in elevation and views of the cactus fade into pine trees. As you continue further into Northern Arizona, travel the outskirts of the Route 66 town of Flagstaff and from the highway, see the San Francisco Peaks among the seemingly endless Ponderosa Pine Forest, the largest contiguous forest of ponderosa pines in the world. 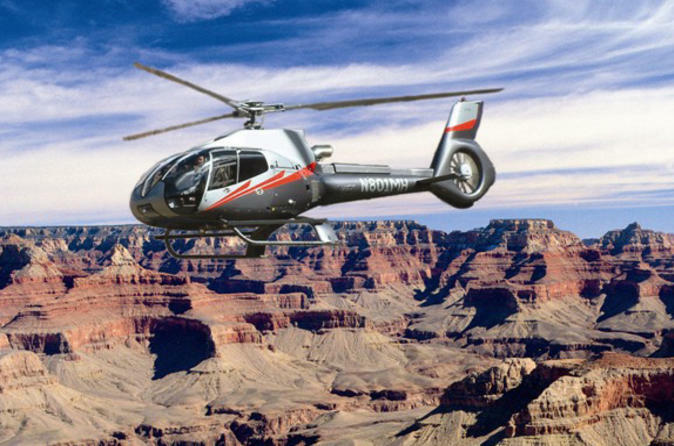 Once at the Grand Canyon South Rim, board a state-of-the-art helicopter for a 45-minute flight over the Grand Canyon. You’ll fly towards the eastern end of the canyon, following the Colorado River, over the picturesque Kaibab National Forest and through the Dragon Corridor, the widest and deepest part of the Grand Canyon. You will be picked back up by your guide and continue on to explore the Grand Canyon National Park. You can take in the natural beauty of the site by walking along the rim trail at one of the lookout points. Also, at the canyon you'll have time to shop and capture incredible pictures of the canyon. You will then head back on a scenic drive back to Phoenix/Scottsdale area.